Love is in the air and in the kitchen. 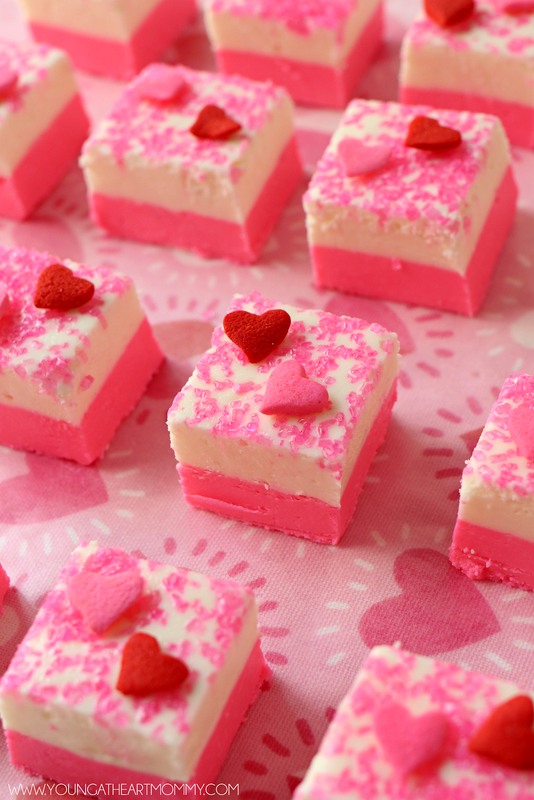 This easy recipe for Valentine’s Day Fudge only requires two ingredients and is the perfect treat for your sweetheart! I’m the biggest sucker for Valentine’s Day. It’s not only the most sweet and sappy holiday of the year but also my little girl’s birthday. She’ll be turning 7. Holy guacamole where has the time gone? Thank goodness she isn’t too old for hugs, kisses, and endless cuddles! Those are the most sought after perks of such a holiday. Since it’s more than just a special time to celebrate, I prefer to skip the store bought treats and make something of my own for her annual party. Last year these Peanut Butter Mousse Brownie Cups were a huge hit! 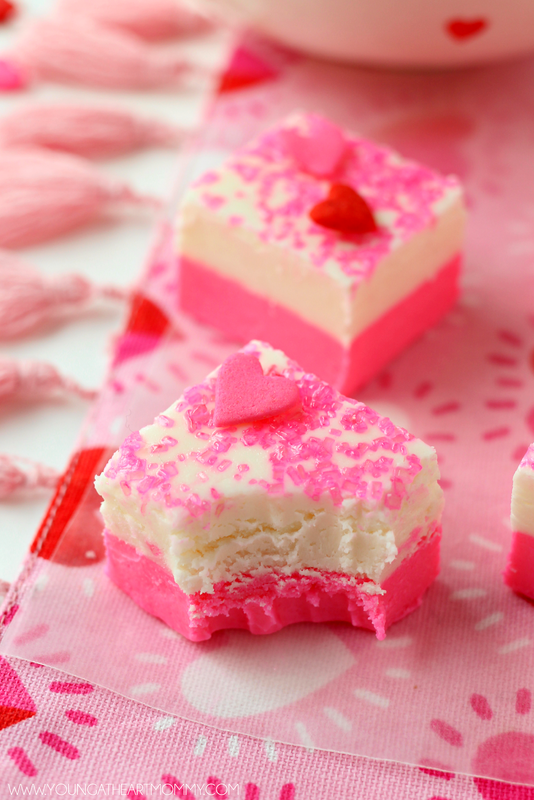 Whether your love bug likes to indulge in decadent desserts or a small bite sized treat to satisfy their sweet tooth, this layered Valentine’s Day fudge is one way to make their heart melt. It’s also super easy to make and only takes two ingredients you may already have in your pantry. Did I mention it’s covered in pretty pink sugar crystals? Even better, right? 1. Line a 8 inch square pan with wax or parchment paper. Leave excess paper outside of the edges so you can easily pop out the fudge when it’s finished firming up. 2. In a medium sized microwavable bowl, microwave pink candy wafers in 30 second intervals. Stir after each interval until creamy and smooth. Be careful not to burn the chocolate. 3. Scoop out one container of vanilla frosting in a separate microwavable bowl and heat for 30-40 seconds or until melted. 4. Mix melted chocolate and frosting together until well blended and PINK! 5. Pour into the bottom of the pan and repeat this step for the top layer of the fudge. You will be combining the vanilla wafers and another tub of frosting. Pour this mixture on top of the pink. 6. 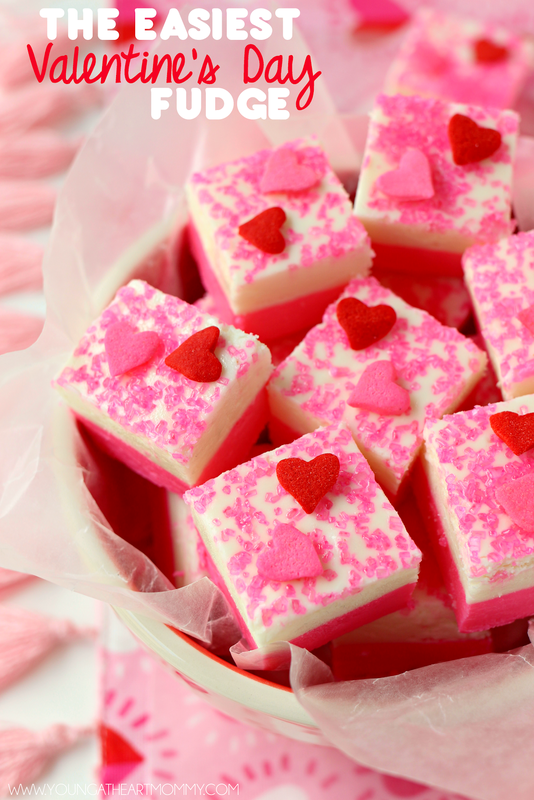 Sprinkle a generous amount of pink sugar crystals on top of fudge. Add jumbo hearts in desired pattern. 7. Refrigerate for an hour and cut into square pieces. This fudge is best stored in the refrigerator between nibbling. Since it does contain frosting it can get rather soft if left out for too long. My favorite part of this recipe is that it can be made in many different ways with a variation of frosting flavors and colors. It doesn’t hurt that it’s also extremely creamy and melts in your mouth! Have you ever used frosting as an ingredient for a dessert other than to frost cakes and cupcakes? This fudge looks so good! 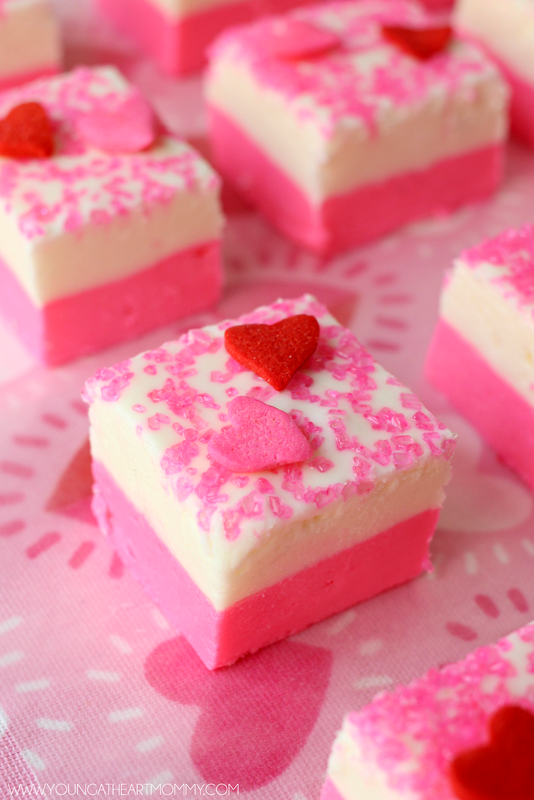 I love fudge and your Valentine's Easter Fudge is so pretty and a really fun one to make. I think you did a good job on making them look so pretty. I bet they taste yummy!